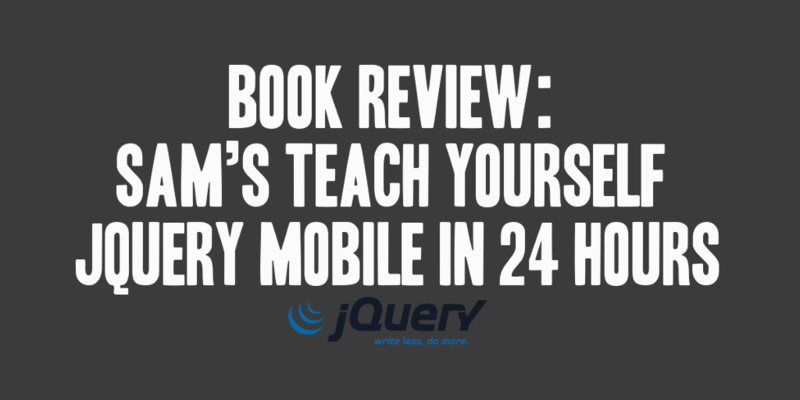 One of my colleagues, Phil Dutson, recently authored the book Sam’s Teach Yourself jQuery Mobile in 24 Hours. The guys is a flat out JS and UI freak, and knows his stuff. I had the opportunity to look at an advanced copy of the book and took the opportunity to review it, and provide a praise quote. I really enjoyed the read, and wrote the following praise quote. I would highly recommend the book to anyone interested in mobile web development. The book is divided into 24 chapters each targeting a completion time of one hour. You will start by learning the basics of creating a mobile web site with jQuery Mobile, and each lesson will expand upon the knowledge you’ve been working with from previous chapters. Over time you will learn the concepts and building blocks that go into creating a truly great mobile web site. The book is filled with numerous and detailed code examples. Phil goes to great lengths to ensure that you see the code put into use, so you can truly understand what is required and where it fits in your development process. He also ensures that you understand all of the concepts within the jQuery Mobile framework, and explains them in great detail, allowing you to understand why it is you’re doing what you’re doing. Each chapter of the book also includes a Q&A section where common questions and concerns are addressed. At the end of every chapter you’ll also find a Workshop Quiz where the reader is reminded of the concepts they’ve just learned. One of the great benefits of this book are the chapters regarding the taking your jQuery mobile development knowledge and translating that into development for the Android platform by using jQuery Mobile and PhoneGap. Overall, I found this book very informative, instructional, and worth the read and application. I highly encourage anyone who is thinking about mobile development, or even Android development for that matter, to consider this book. You can find Phil’s book for sale online at Amazon.com by clicking the link. Hi Drew, thanks for the favorable comments and review. I appreciate the feedback and the write up for the book. I tried to make this book accessible not only to developers but to managers and marketing departments. Really it’s kind of as a one-size-fits-most mobile projects. For anyone who wants to for-go the morning bit of wake-up juice, you can instead deposit $2 into the standalone version of Hour 20 – Creating QR and Tag codes currently available on Amazon for your kindle (or device running the kindle app). This gives you a great look at creating and managing QR and Tag codes as well as shows you what you can expect as far as writing style used in the rest of the book.